If you catch a trend early enough you can enjoy it a little longer. At Roberson’s Fine Jewelry in Little Rock, AR Trish Roberson and her staff have built their brand around serving you with fashion-forward jewelry designs, before most anyone else has heard of them. When you go into this super fine jewelry store, we admit, it’s hard to stay focused. There are so many pretty things to see! But no worries. The team at Roberson’s is very good at what they do. You will walk out with the perfect engagement ring… and all your bridal jewelry… and maybe more! We are thrilled to call Roberson’s Fine Jewelry of Little Rock our Coast Diamond Retailer of the Week. Rings are the “it” piece of jewelry. If you are a hopeful bride-to-be, an engagement ring is the piece of jewelry you are dreaming of. Engagement ring trends change. It is important to know how to incorporate them into your Coast Diamond engagement ring that you plan to wear for a lifetime. Roberson’s Fine Jewelry can help you do that. If you incorporate engagement ring trends or if you want to stick to something more traditional, this Coast Diamond engagement ring (LJ6024) has the versatility you want. It has two rows of fishtail set diamonds that lead up to a 1.5-carat center stone of your choice. Trend Alert: Colored center stones are a trend to take notice of. A blue sapphire would be amazing in this setting of platinum. A gorgeous Coast Diamond band (WC5181H) is the perfect piece to wear every day. It is low profile but high dazzle, with nearly a half carat of fishtail set diamonds across the top. Trend Alert: This band is a perfect choice for sparkle in the biggest jewelry trend today… the ring stack. This Coast Diamond band (WC7034) is the perfect example of fashion-forward. It has three round diamonds set in marquise shapes. Check out this band in the Coast Diamond ring stack image above, third from the top. See more Coast fashion rings here. Trend Alert: Mixing metals is fabulous. 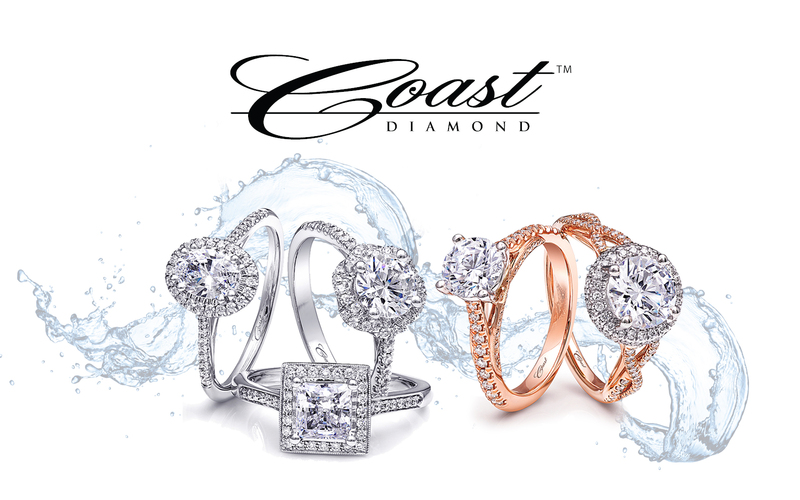 All of our Coast Diamond designs are available in rose, yellow, or white gold or platinum. It is exquisite, timeless, coveted. It stands the test of time. It is proven to be of great value. Heirloom quality diamond engagement rings reflect each of these things. Coast Diamond rings are elegant designs created with superb quality, perfect as a family heirloom. History, innovation and family are a few of the pillars that H.L. Gross & Bro. Jewelers have built their heritage around. The most impressive ingredient of their heritage is time. H.L Gross & Bro. have spent 108 years creating a history of following the needs of customers, throughout five generations of this family business. We are thrilled to have H.L. Gross & Bro. Jewelers of Garden City, NY as our Coast Diamond Retailer of the Week. An English paper by Corrine Gross (16 years old at the time) detailing the history of her family’s jewelry business. A truly interesting read. A H.L.Gross & Bro. sales receipt from 1929 showing the sale of a platinum marquise diamond ring for $200. At Coast Diamond it is our desire to create exquisite designs that are graceful and stylish. They are designs that will adorn someone in your family for generations. Have an heirloom diamond that needs the perfect setting? This Coast Diamond engagement ring (LC6033) is the perfect choice. The solitaire setting fits any size or shape diamond center stone and it will be perfectly accented by the 0.74CT of round brilliant prong set diamonds on the band, with another 0.88CT on the matching wedding band (WJ6033). What bride does not covet this stunning ring to sit beside her engagement ring. This Coast Diamond 0.84CT wedding band (WC20018) from the Allure Collection is two rows of round brilliant diamonds set with microprongs for lots of sparkle. What a treasure to have this in the family! The Coast 3.23CT diamond wedding band (WJ6057) set in 18K white gold will be the talk of the family. Definitely the ring to celebrate an anniversary or special occasion when you want her to know she is the love of a lifetime. H.L. Gross & Bro. Jewelers makes it their goal to serve you and your family for generations. Visit them today and experience for yourself why they have such a rich heritage in the engagement ring business. Congratulations to H.L. Gross & Bro. Jewelers of Garden City, NY for being our Coast Diamond Retailer of the Week! The first thing someone asks you when you get engaged is “Let me see your ring!” When you #ShowYourCoast they learn a little more about who you are. The shape of your engagement ring says something about you. Are you simple? Are you creative? Are you warm? At Coast, we appreciate a retailer who serves each customer based on who they are. A retailer who will celebrate with you when you find that engagement ring that is you. Diamonds Direct in Indianapolis will help you maximize your budget and find the right engagement ring. We are excited to celebrate Diamonds Direct of Indianapolis as our Coast Diamond Retailer of the Week for their passion and commitment to you. Whether you’ve dreamed of a sweet symbol of your love, a sophisticated symbol of your commitment, or a sun-drenched symbol of your passion you will see them all at Diamonds Direct, Indy when you visit their Shapes of Spring Designer Showcase. For Spring, our Coast Diamond engagement rings are sweet, sophisticated and sun-drenched. At first glance, it is a simple solitaire engagement ring, but look closer and find the sweeeet surprise of pavé set diamonds in the gallery. This Coast Diamond 1 carat solitaire engagement ring (LC5229) has a high polished band that makes this simple but sweeeet engagement ring awesome. The oval diamond center stone is the shape of sophistication in an engagement ring. This Coast Diamond oval halo engagement ring (LC5410-OV) is surrounded by round brilliant diamonds on the halo and band of the ring. This Coast Diamond 1.5 carat engagement ring (LC5449RG) is a spectacular sun-drenched take on the beloved halo design. It has delicate strands of diamonds that intertwine around the center stone and continue down the sides of the ring. The sun-drenched warmth of the rose gold setting is a stunning finish for this unique engagement ring. Visit the Diamonds Direct Shapes of Spring Designer Showcase the weekend of April 20-22, 2018… or any day of the week you are looking for the Coast Diamonds engagement ring of your dreams. Congratulations to Diamonds Direct, Indianapolis for being our Coast Diamond Retailer of the Week! Enjoy the Shapes of Spring Designer Showcase! Since the beginning of time (well… diamond engagement ring time) the delicate diamond band of an engagement ring has been the most delightful detail to a bride. Since the beginning of time (well… over the past one hundred years), Rufus D. Lewis Jewelers of Spartanburg, SC has been guiding couples as they choose the engagement ring of their dreams. Their promise to you is to provide the highest quality diamond jewelry at the most reasonable prices in the Carolinas. A century of special moments don’t just happen. Rufus D. Lewis Jewelers promises a commitment to quality and attention to detail that leads generations of customers to count on them to make every occasion special. This is why we are thrilled to call Rufus D. Lewis Jewelers our Coast Diamond Retailer of the Week. A delicate diamond band is the ideal finish to this exquisite two carat Coast Doamond solitaire engagement ring (LC10020). Each hand set diamond makes this an engagement ring of refined gorgeousness for your Carolina bride! A unique split of fishtail set diamonds on the band of this one carat Coast Diamond solitaire engagement ring (LC6054) gives it a graceful quality. The fine lines of diamonds will melt the heart of your Carolina bride. Petite diamonds encircle the halo that crowns the Coast Diamond halo engagement ring (LC5410-RG) set in rose gold. The most exciting thing about this Coast engagement ring is the design compliments your choice of center stone like those pictured below: (clockwise from top) oval cut, cushion shaped with round center diamond, princess cut and pear cut. All of our Coast Diamond engagement rings are also available in your choice of rose, yellow or white gold, or platinum. See more variations of this delicate Coast halo engagement ring here. Congratulations to Rufus D. Lewis for their continued success in the fine jewelry business and for being our Coast Diamond Retailer of the week, once again. upcoming Bridal event Friday, April 13th to Sunday April 15th. View Coast Diamond stackable rings, bands and more!